HIGHWAY SCENES to 3D FAST! For the documentation of an accident scene you will usually use the ACCIDENT, CARS, FIRE-CARS, MACHINES, AIRPLANE and TRAFFIC libraries. 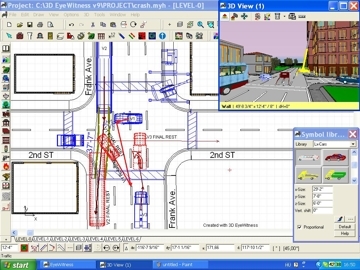 ROADCAD feature allows you to quickly draw streets and intersections. Simply specify the lanes and other optional information, then apply this data to any line, arc, or curve to create a street. ROADCAD feature includes pre-drawn templates of streets and intersections too. You can modify the pre-drawn streets and intersections or use the ROADCAD feature to draw your own. You can create maps up to date - just open the existing file with the diagram, make the changes and print a new copy! You can also document accident scenes with your 3D EyeWitness program. Quickly Dimension Entire Scene ! 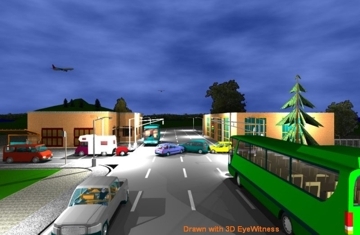 3D EyeWitness dimension tool automatically calculates distances at any angle or length. 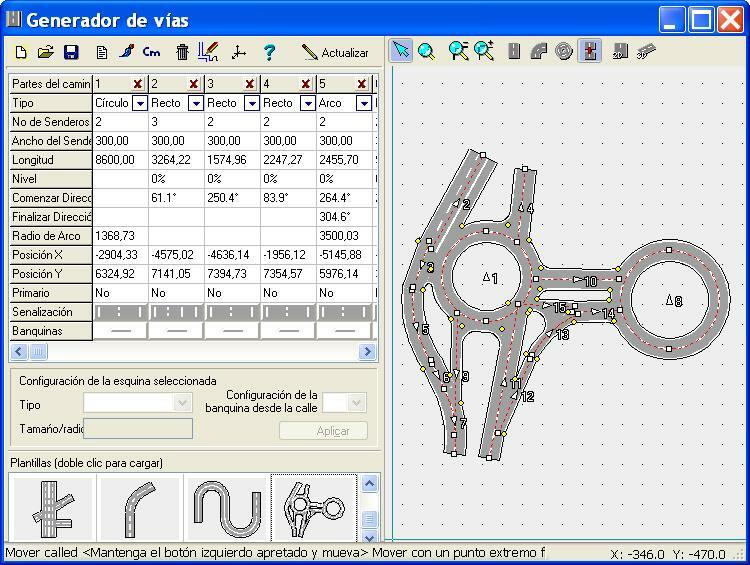 The easiest way to draw the scene, the roads and intersections is to use ROADCAD module. It is recommended that you work from a sketch of the scene. This makes examination on the actual scene easier by placing the events of the accident on the road plan. Don't delay, order 3DEyeWitness today. You'll get 2D and 3D power, more than 1000 3D symbols, plus 3D MovieMaker and Scene Inventory modules. 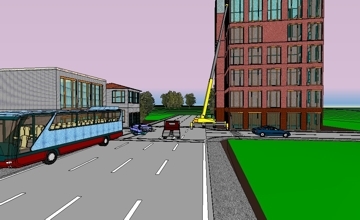 An accident reconstruction diagram with Digital Camera image inserted into the diagram. DesignWare accepts credit cards, checks, and even departmental purchase orders. Simply fill out and return the order form. Don't delay, order 3DEyeWitness today. You'll get 2D and 3D power, more than 1000 3D symbols, plus 3D MovieMaker, Scene Inventory and ANIMATION modules. Free DEMO ! Order CD version Order DOWNLOAD version! Recommended: Pentium or better recommended.